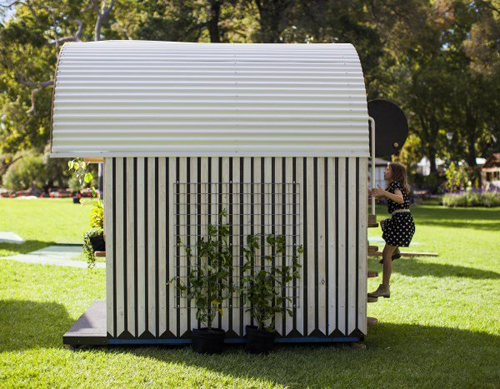 The Cubby House Challenge is an annual auction held in Melbourne raising money for the Kids Under Cover organisation to prevent youth homelessness. 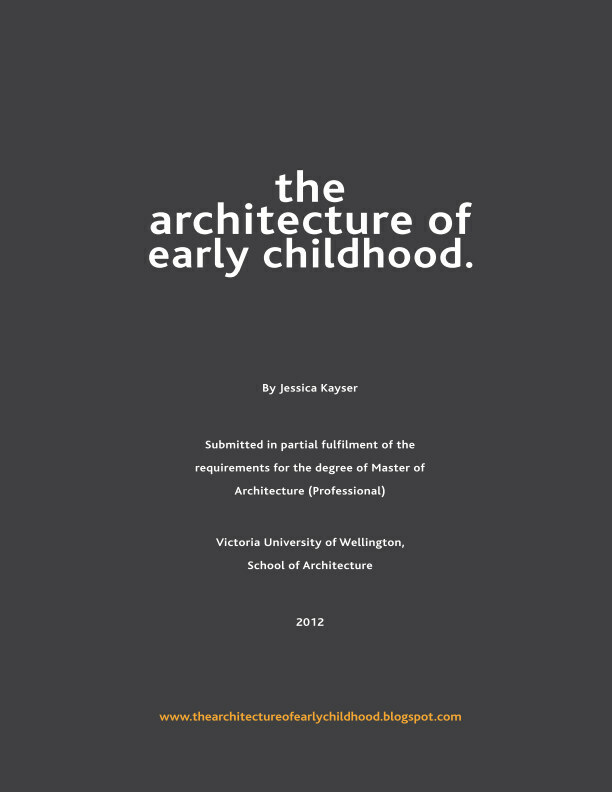 A previous blog post on The AEC covered some of the fun (and wacky) entries to date. 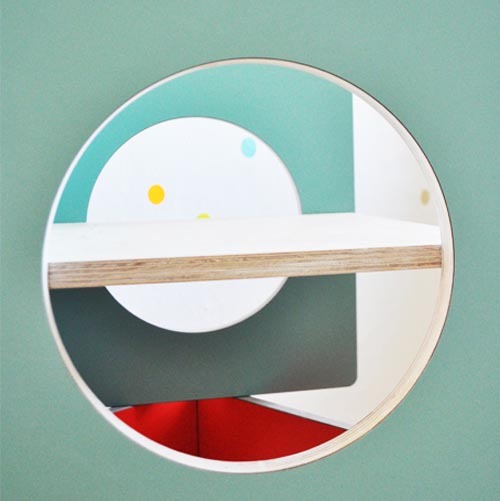 Below however is one of my favourite home fitout designers' 2015 entry - designed by the Doherty Design Studio and built by Visual Builders. 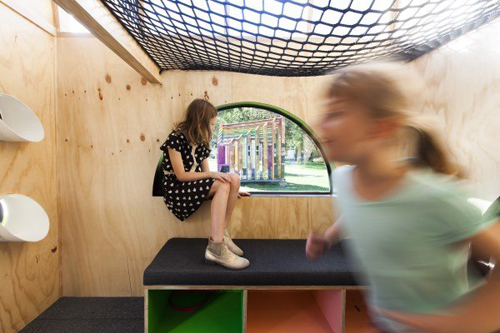 The Vardo Hut was designed by Mardi Doherty, whose inspiration came from memories of her own childhood: "Cubbyhouses represent some of the happiest times of my childhood and, today, play an essential role in my own children's recreation and creative development. 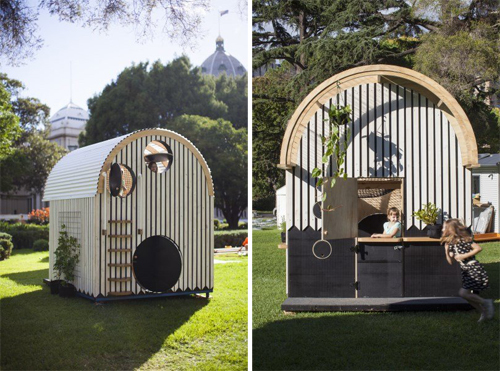 I wanted our Vardo Hut to stimulate that same happy, escapist feel for other children, while also sitting in harmony with the garden." 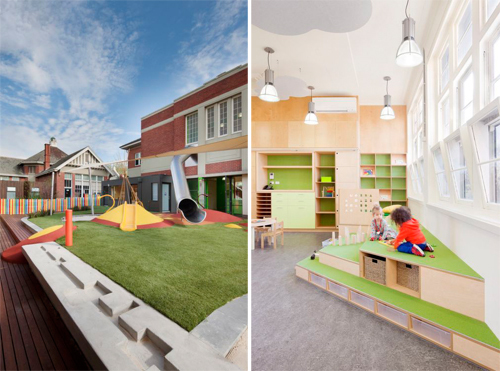 Doherty Design's previous projects have displayed a knack for crafting spaces that pay close attention to materiality and detailing - combining a sense of play with functionality. 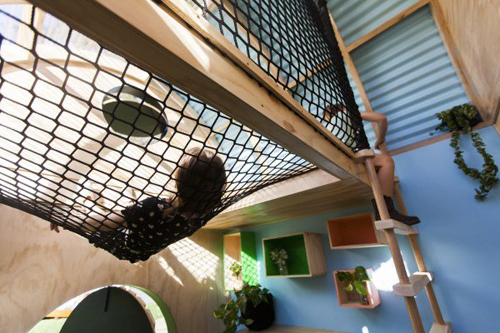 And the Vardo Hut continues this sensibility, the form mimicking the frontage of a traditional Gypsy Wagon and the fitout utilising a selected material and colour palette to create a number of fun and intimate "chill out" spaces. 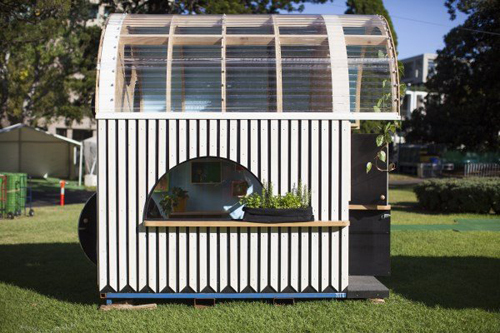 The exterior's curved semi-transparent platic roof cleverly allows light in, whilst the forms vertical timber slat cladding fitted with mesh for creeping plants and a ledge for storage and display creates a homely feel. 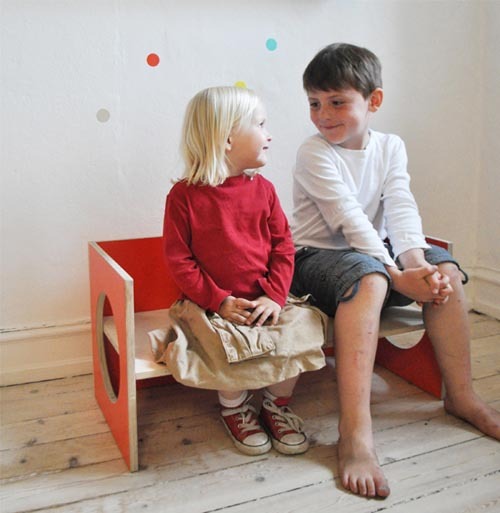 A ladder to a loft and various sized circle window cut-outs with tilted shutters invite the children to interact with and manipulate their environment. 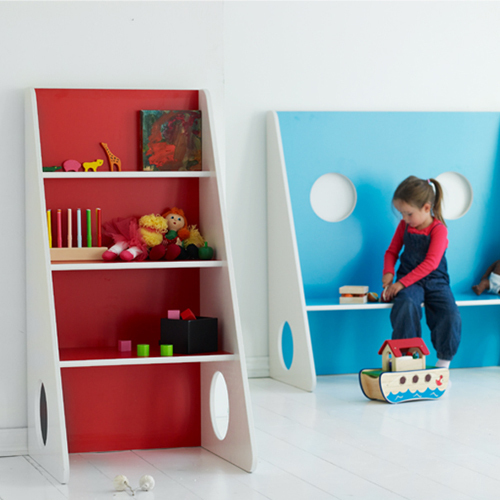 The multiple points and methods of entry engaging the young mind and offering a sense of adventure, whilst encouraging physical development through the use of co-ordination and gross motor skills. 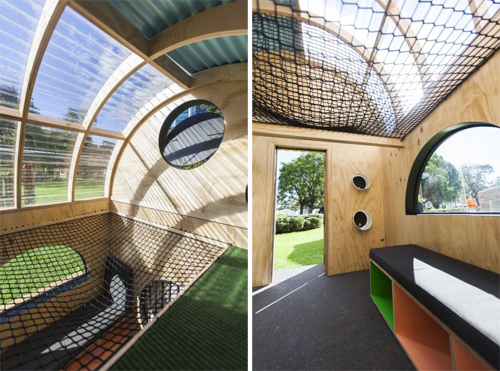 Inside, a natural ply structure, wall and joinery finish is combined with artificial grass, a black net and coloured window and cabinetry inside faces. 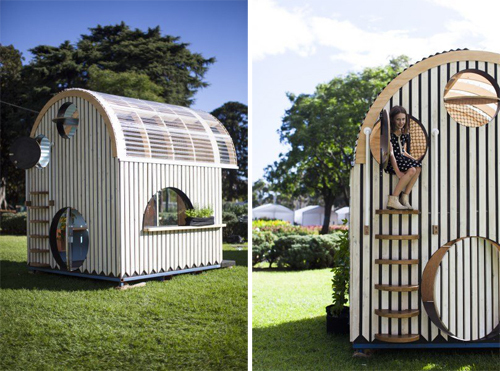 The hut won People’s Choice Award and sold for $9000.00 at an Auction, the highest price reached out of the six entries and well over its reserve of $6500.00. 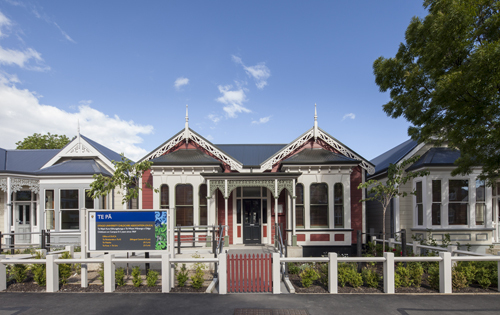 The newly refurbished OUCA (Otago University Childcare Association) Childcare or “Te Pā” in Dunedin has been granted a win at the recent 2015 Southern Architecture Awards for it's "meticulous attention to the reuse of prominent building elements" and for being a "dynamic, multicultural and enjoyable building" (NZIA, 2015). 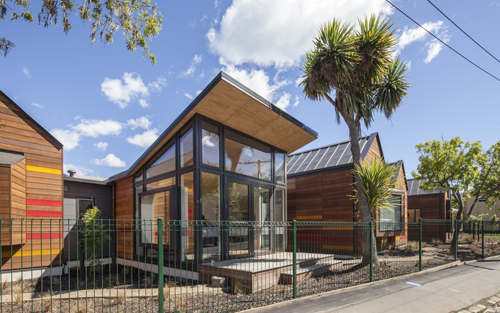 Designed by the team at Parker Warburton Architects, the now 140 child capacity centre utilises elements (including the street facade) of existing original 19th century villas. 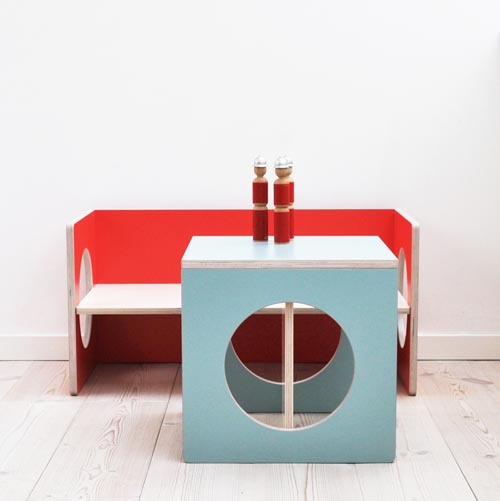 Meanwhile the architects have extended the structure at the back, a design that both echoes the existing villa aesthetic whilst providing a more "contemporary" construction of clean lines, stained timber slats and pops of colour. 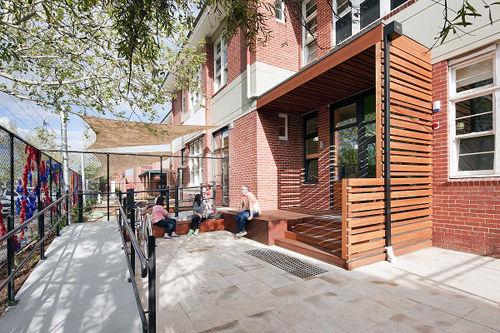 The centre also receiving a Resene Colour Award for providing a "restrained, pleasant colour palette reinforcing the rhythm of the street" and with the "mix of warm natural timber and splashes of reds and yellows adding a fun, dynamic aesthetic to modern forms." 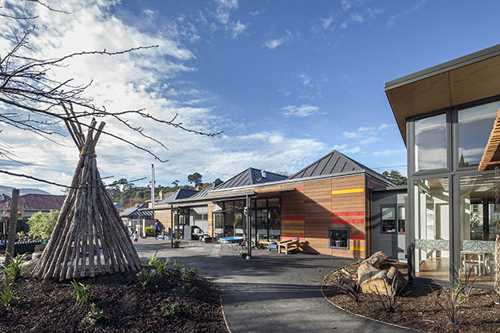 Teepees, forts, playrooms, art spaces, gardens and teacher offices make up the playful microcosm of this centre that both promotes playful exploration and provides a warm "homely" and comfortable feel. 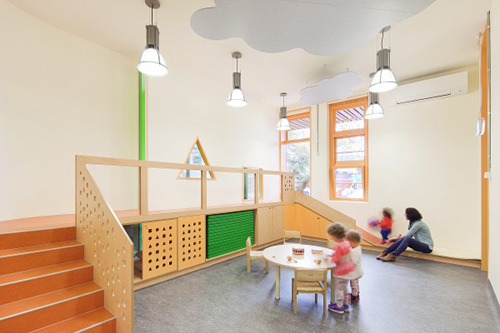 The design sensitively carries through traditional elements such as the natural stained timber trims - (skirtings, dado and architraves) through to the new structure providing a seamless transition. 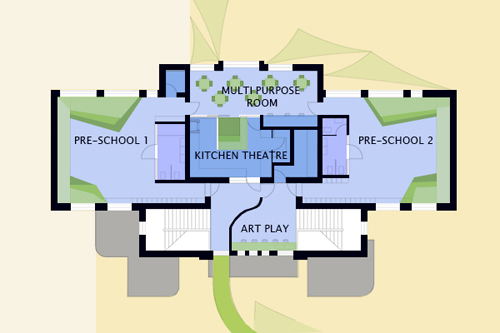 A "finger" or splayed spatial arrangement in plan results in maximum connection from inside to the natural outdoors - allowing natural sunlight and ventilation to be used throughout. 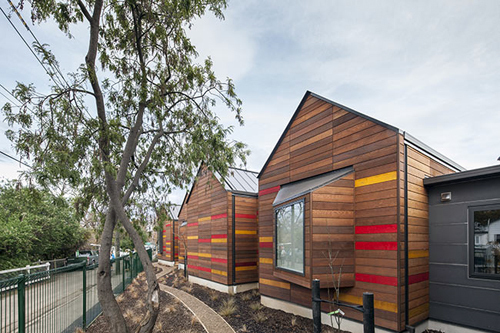 Inspired by a journey from the mountains to the sea, a meandering covered walkway connects the existing villas to the row of five new buildings which enclose the site along the Water of Leith. 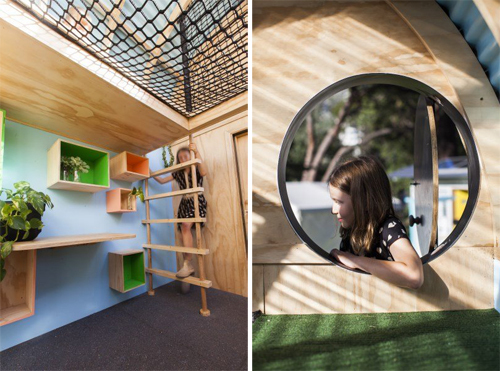 Amidst this enclosed space is a variety of outdoor play elements - man-made and natural to encourage free and active play. 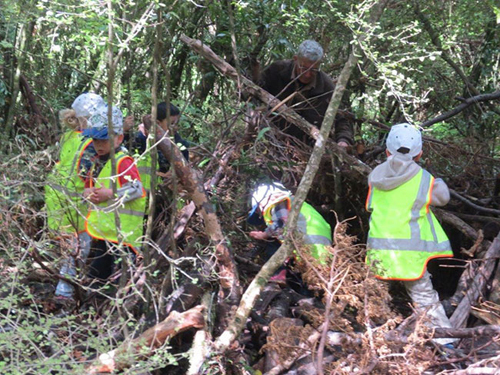 In fact a unique part of the OUCA pedagogy is the "bush curriculum" whereby teachers take groups of the older children into the bush to "explore" (ERO) - a great concept for children to further get access to the natural outdoors and use their creative imagination. 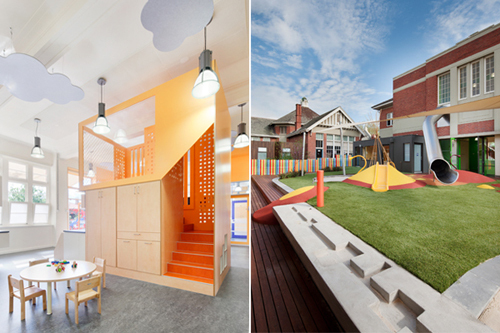 Designed by Steffen Welsch the Froebel Early Learning Centre in Melbourne has undergone a transformation. 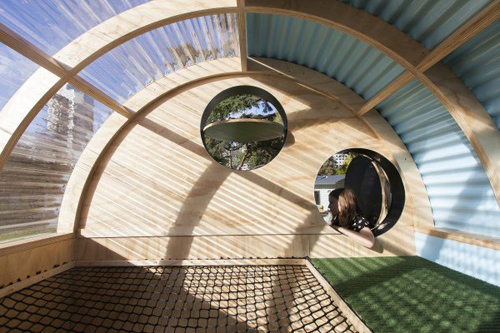 From a derelict old brick school building into a place where a child's imagination and capacity for play is cherished - with a slide that takes children from the top level to the playground below even! 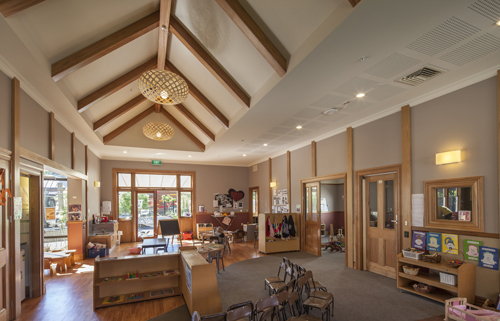 The bi-lingual (English and German) speaking centre offers childcare to 66 children from 6 weeks to five years and is part of the existing Deutsche Schule Melbourne campus. 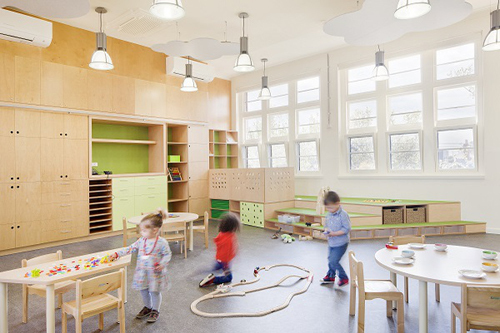 A two-level play pod, reading nooks, a ‘Little Scientists’ corner, a kitchen theatre – are just some of the features that make the centre a magical place for children that facilitates learning opportunities on many different levels – playful language learning, science & maths, health & nutrition, nature experiences and appropriate risk-taking. 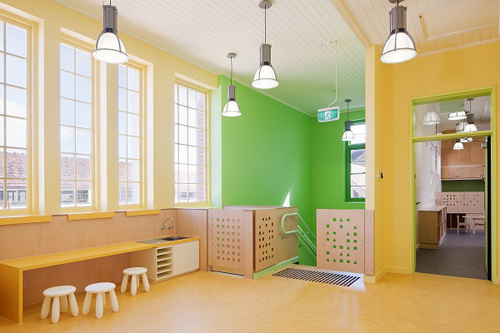 Custom joinery includes natural and coloured timber stairs ascending to a stage, a sloping slide and an abundance of storage and nooks between. 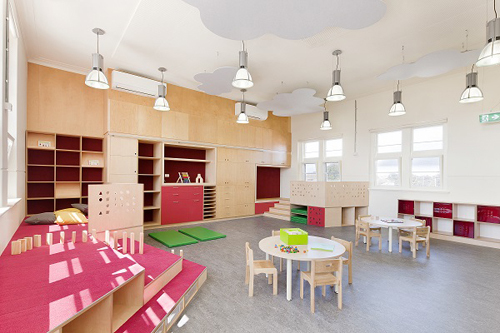 The ceiling is also considered with "floating" grey clouds. 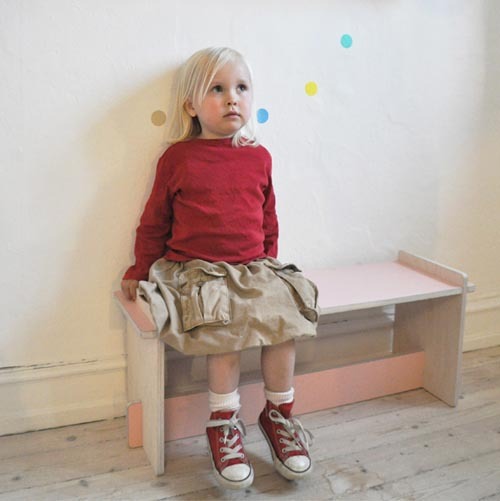 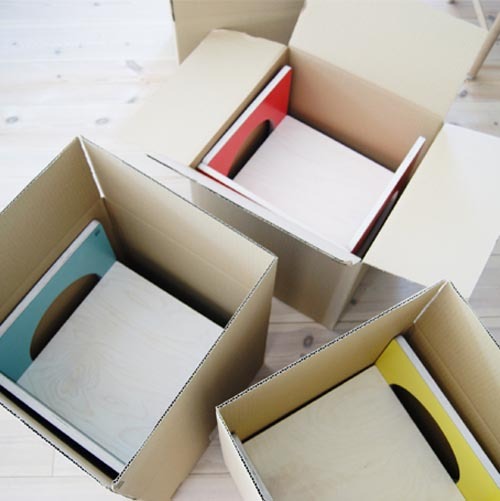 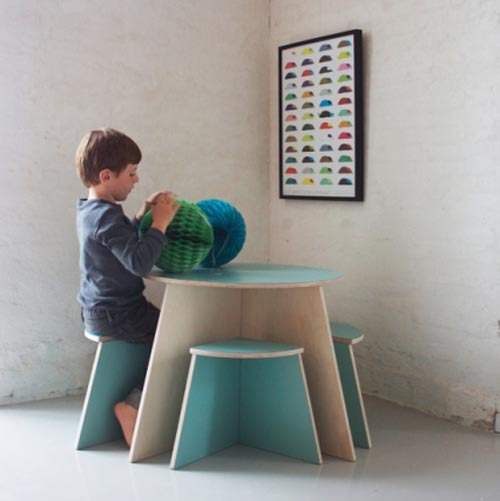 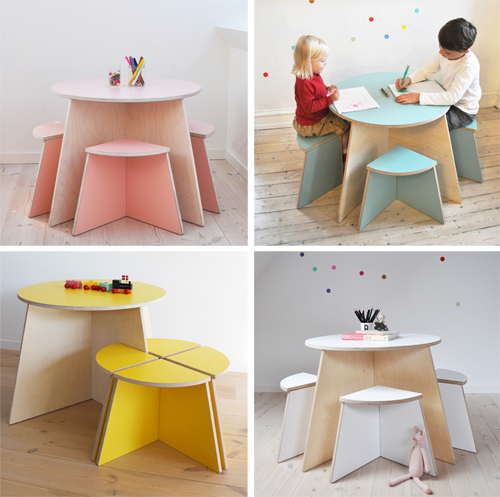 All considers the scale of the child and intends to challenge them physically and imaginatively. 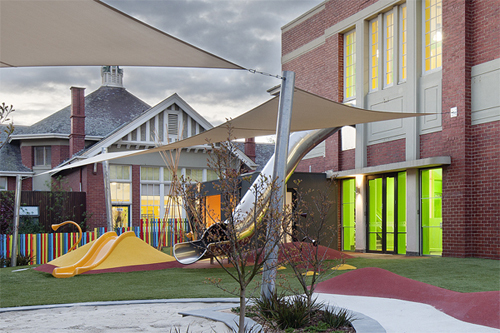 Materials and colour are used intentionally - to both accentuate the existing warmth of the brick and to inject play and flexibility into an otherwise rigid and timeless structure. 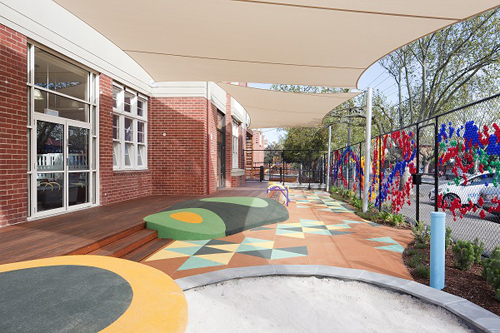 Above, textured mounds or "hills" are cleverly transplanted over the shallow timber stairs down to a covered courtyard and sandpit. 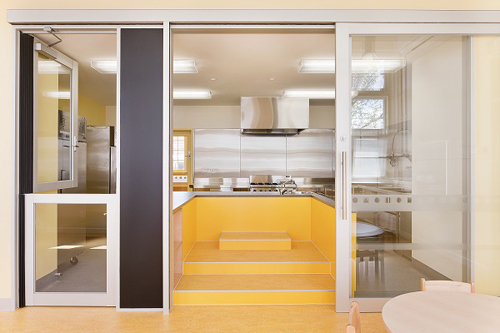 The centre provides both group "play" rooms and shared spaces, such as the "kitchen theatre" seen below where children can stand atop yellow platforms and learn all about food and healthy eating. 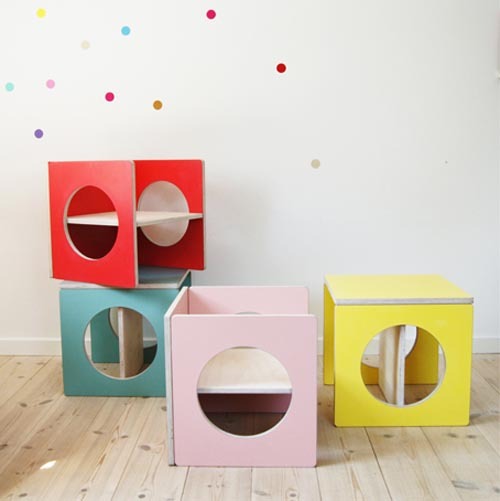 It's a centre that I'm sure Friedrich Froebel himself would be proud of - inhabiting his pedagogical theory of "learning through play".